Catch a Wave! Join the National Science Foundation (NSF) for a look at the science behind the "sweet spot" we call summer. The lyrics to the tune "In the Good Old Summertime" were written in 1902 by songwriter Ren Shields. As Shields knew, many of us wait all year for summer. Now, a new NSF special report, Catch a Wave! The Science of Summer, takes you on a splash in the ocean, a trip through a red rock canyon in the U.S. West, a refreshing dip in a freshwater lake — and beyond – with NSF-supported scientists. Far below the shallows, these researchers are on a journey to the bottom of the sea, where the submerged continent Zealandia is hidden. NSF-funded scientists are discovering beautiful, iridescent comb jellies that flamenco dance through the ocean's depths, and coral reefs, besieged around the world, that thrive near a remote South Pacific island named Mo'orea. Fearful of a shark attack on your day at the beach? Sharks are often the good guys. They're protecting vulnerable seagrass beds, important nurseries for young fish. Where sharks rove, seagrass-feeding dugongs and other shark prey steer clear. That keeps important underwater grasses from disappearing. What about 'gators, rulers of the U.S. Southeast's salt marshes? They, too, have a beneficial role: ferrying nutrients between sea and shore. On land, it turns out that the insect- and rodent-hunting habits of American kestrels, the most common birds of prey in the U.S., are helping farmers use fewer pesticides on their crops. But not all is well in the world of summer. Increasing rainfall in a changing environment is polluting U.S. waterways with excess nitrogen, leading to algae blooms and impairing coastal water quality. Hurricanes, more common over the past two decades, are also contributing to water pollution. The storms' thundering floodwaters carry huge amounts of nutrients downstream, fueling fish kills and low-oxygen coastal dead zones. Meet sharks and alligators up close and listen to the eerie sounds of the West's rock arches. Explore a lost continent and dance with an iridescent sea creature. 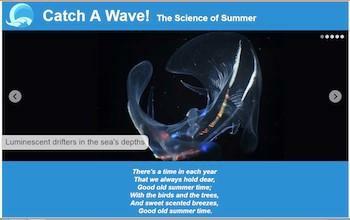 Enter the world of summer with the scientists who are revealing its secrets. Catch a Wave! The Science of Summer follows the NSF special reports: April Showers Bring…The Science of Spring and Let It Snow! The Science of Winter.